Exomphalos results from failure of normal embryonic regression of the mid-gut from the umbilical stalk into the abdominal celom. 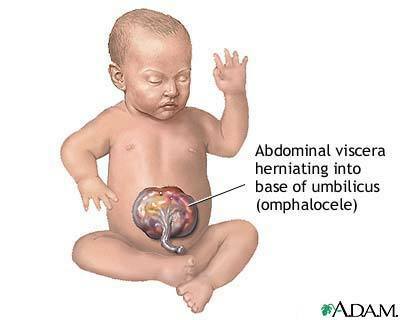 The abdominal contents, including intestines and liver or spleen covered by a sac of parietal peritoneum and amnion, are herniated into the base of the umbilical cord. Exomphalos is found in about 1 per 4000 births. The majority of cases are sporadic and the recurrence risk is usually less than 1%. However, in some cases, there may be an associated genetic syndrome. Chromosomal abnormalities (mainly trisomy 18 or 13) are found in about 50% of cases at 12 weeks, 30% of cases at mid-gestation and in 15% of neonates. Similarly, in Beckwith– Wiedemann syndrome, most cases are sporadic, although autosomal dominant, recessive, X-linked and polygenic patterns of inheritance have been described. The sac protrudes in the midline, through the umbilicus (navel). It is normal for the intestines to protrude from the abdomen, into the umbilical cord, until about the tenth week of pregnancy, after which they return to inside the fetal abdomen. 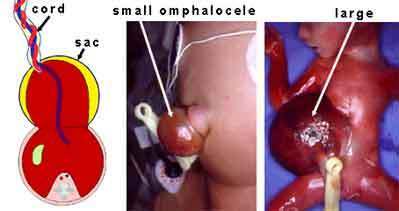 The omphalocele can be mild, with only a small loop of intestines present outside the abdomen, or severe, containing most of the abdominal organs. In severe cases surgical treatment is made more difficult because the infant's abdomen is abnormally small because it had no need to expand to accommodate the developing organs. The diagnosis of exomphalos is based on the demonstration of the mid-line anterior abdominal wall defect, the herniated sac with its visceral contents and the umbilical cord insertion at the apex of the sac. Ultrasonographic examination should be directed towards defining the extent of the lesion and exclusion of other malformations. Exomphalos is a correctable malformation in which survival depends primarily on whether or not other malformations or chromosomal defects are present. For isolated lesions, the survival rate after surgery is about 90%. The mortality is much higher with cephalic fold defects than with lateral and caudal defects.